In this sequel to The Hunger Games, Katniss returns home after her “victory” in the Arena. She soon learns that though all victors are promised a life of ease and luxury as a reward, the price she and her fellow victors pay is steep—and the price keeps getting higher. What was a small act of rebellion in the first book ignites a massive uprising throughout the country. Now, whether she’s ready or not, Katniss herself becomes the symbol of the rebellion and the one person that the crushed population looks to for direction and hope. Have mercy. 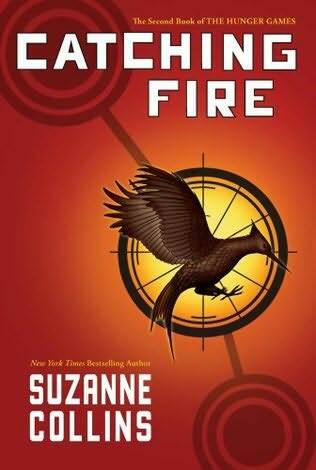 I challenge anyone to read this book and not have to continue directly on to the third book in the series: Mockingjay. In fact, all three of these books are really just components of a large ongoing thrill ride. The ride doesn’t end with each book’s close; it merely pauses long enough for you to catch your breath before cracking the cover of the next one. I was completely riveted by the first book; I read the last half of the book in one sitting. And I didn’t think it was possible, but this one is even more ruthlessly addictive. Here are some of the things you can look forward to: the love triangle between Katniss, Peeta, and Gale heats up; the cruel President Snow himself makes several appearances; this year’s Hunger Games return with a diabolical design and the twist that nobody—Katniss least of all—sees coming. I think I can safely say that if you loved The Hunger Games, you’ll drool with delight when you read Catching Fire. I recommend this book to fans of The Hunger Games and other dystopian novels of this genre. Again, there are some graphic, gruesome, and violent scenes that I think are way too intense for those younger than 13.